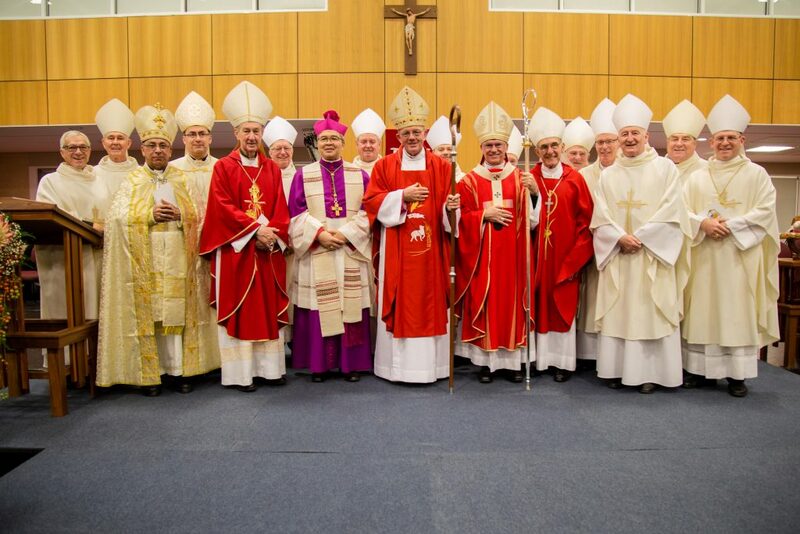 Newly ordained Bishop of Geraldton, the Most Rev Michael Morrissey (centre), with Apostolic Nuncio His Excellency Archbishop Yllana (seventh from left) Perth Archbishop Timothy Costelloe (seventh from right), Archbishop Emeritus Barry Hickey (fifth from left), Bishop Emeritus of Geraldton Justin Bianchini (fifth from right) and fellow Bishops from across Australia. Photo: Jamie O’Brien. Newly ordained Geraldton Bishop Michael Morrissey encouraged the lay faithful to model their behaviour on Jesus Christ, ‘who became vulnerable for our sake, and who reveals to us through the Holy Spirit, God’s love for us’. “To remain faithful to the Gospel and reflect through our words and actions the humility of Jesus Christ, is the challenge for our Church and its leaders,” Bishop Morrissey said. “‘With Trust in the Lord’, together we will walk on the journey, a journey of hope filled with the joy of the Lord. This will be my mission of service to you as your Bishop,” he said. The Most Reverend Michael Morrissey was ordained the ninth Bishop of Geraldton on the eve of the feast Saints Peter and Paul, on Wednesday 29 June at Nagle Catholic College Gymnasium. Most Reverend Barry Hickey and the Most Reverend, Justin Bianchini, Bishop Emeritus of Geraldton. The Apostolic Nuncio in Australia, His Excellency the Most Reverend Adolfo Tito Yllana read the Papal Bull in Latin followed by a translation in English. Bishop-Elect Morrissey is the first Bishop of Geraldton who was born, raised, ordained and ministered in the Diocese and said his appointment recognises all the small communities scattered throughout the diocese. Held in the gymnasium of Nagle Catholic College while St Francis Xavier Cathedral is undergoing renovations, Kathy Councillor extended a Welcome to Country to Bishop Morrissey and the assembled Archbishops and Bishops on behalf of the Naaguja people. Born in Yalgoo on 9 September 1952, Bishop-Elect Morrissey received his primary school education via Correspondence and School of the Air lessons supervised by his Mother, Margaret Morrissey. Secondary education was educated at Aquinas College, Perth. He continued his studies at St Charles Seminary in Perth and at St Francis Xavier Seminary, Adelaide. He was ordained a priest on 31 January 1981 in St Francis Xavier Cathedral, Geraldton. From 1981 to 1984, he worked as Assistant Priest in the Parishes of Bluff Point and Port Hedland. He served as Administrator in the Parishes of Bluff Point, Port Hedland and South Hedland between 1984 and 1985. In his homily for the occasion, Archbishop Costelloe said that for someone who grew up on a sheep station near Yalgoo, the new bishop will hardly need an explanation of what sheep are like or what shepherds do. “He will have a deep instinctive understanding of what it means to talk about the pastoral role of the Bishop and why Jesus himself understood his life and ministry in such terms,” Archbishop Costelloe said. “It is of course through the powerful presence of God’s Spirit, acting through this sacrament of Holy Orders, that our new bishop will be not just commissioned but enabled by God’s grace to be all that the Lord and his Church requires of him as a bishop, a successor of the apostles, in this diocese and in the Church,” Archbishop Costelloe said. “Bishop Michael, through the grace of this sacrament of God’s provident love, you will be remoulded, reshaped, into a living image of the presence of the one true Good Shepherd among his people. In this sense the words of Saint John the Baptist in reference to Jesus must hold good for you as well: He, Jesus, must grow greater and I must grow smaller,” he said. Following his ordination, Bishop Morrissey said it is with a sense of joy, and hope, and ‘Trust in the Lord’, that he has accepted this new ministry. “To paraphrase Hebrews 12:1, I am surrounded by a great cloud of witnesses to the faith, who have been an important part of my life as a Priest,” Bishop Morrissey said. “At this time our Church is weighed down and under intense scrutiny because of failures in being true to the Gospel by individual members of the Church. This affects us all and could have caused me to hesitate in accepting this call to be your Bishop. However, I found hope and encouragement through the lives of Saints Peter and Paul. “Peter, in the midst of his failure to stand up for Jesus in his hour of need, received the Grace to change. Paul, through the power of the Spirit and with his rich understanding of the Hebrew Scriptures, knew he had to change. We will have to change as a Church and especially in the way we lead. Pope Francis calls us to listen with humility and accept our failures of leadership,” he said. He paid tribute, together with fellow Bishops present for the occasion, to Bishop Justin Bianchini for his service as the eighth Bishop of Geraldton for 25 years, from May 1992 till now. The Diocese of Geraldton encompasses the mid-western section of the state of Western Australia, is one of the world’s largest dioceses in territorial terms, covering an area of 1.3 million square kilometres, from Port Hedland in the North to Leeman in the south to the Northern Territory and South Australian boarders. The Catholic population of 29, 300 people live in 16 parishes and 24 missions, which are served by 18 parish priests and assistant priests, 35 religious and three seminarians.